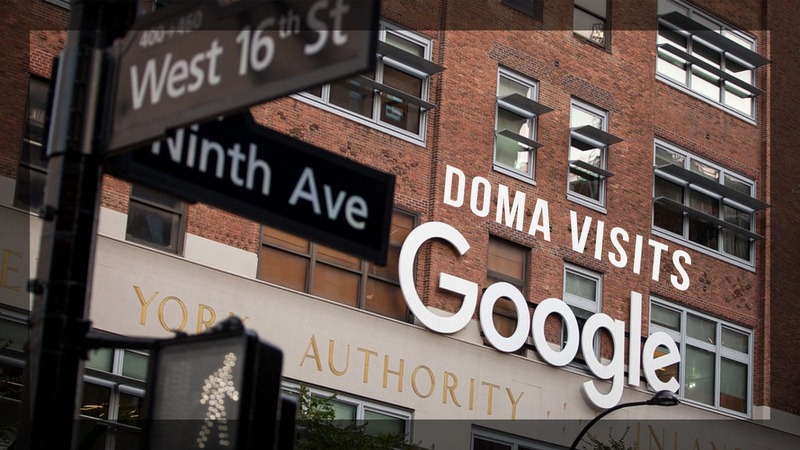 DOMA CEO Pat Feliciano was afforded the exciting opportunity to visit Google’s New York City headquarters this month. Google’s NYC campus is nestled just south of the West Village and occupies 1.7 million square feet. Google’s move to NYC heralds an east coast shift that is slowly gaining momentum with many silicone valley tech companies like Amazon, Apple, Facebook, and Linkedin. Many of the tech giants taking part in this mass migration site untapped talent as major factor in their move. Indeed, Google alone plans to bring over 15,000 jobs to New York. Technology is rapidly outstripping law and finance as the East Coast’s major economic driver. Google’s east coast campus takes great pains to appreciate and evoke the quirky vibe of the city it now calls home. Unexpected nods include subway grates in the hallways, fire hydrants, and focus rooms decorated to feel like authentic studio apartments. Different wings thematically evoke surrounding New York boroughs including the Meat Packing district and Chelsea. The eclectic interior design inspires engagement and collaboration. Carefully planned spaces foster what Laura Gimpel, Google Regional Facilities Manager for the East Coast, calls “causal collision”. Causal collision is the chance interaction that occurs when unacquainted staffers meet. Google believes these chance meetings can foster cross pollination and innovation in unexpected ways. Ultimately, the campus is a social setting, that is meant to drive culture and keep the team motivated. In addition to the facility tour Google provided a market analysis for DOMA where the Google team shared some of their insights on both how we could improve our corporate culture and how we could make strides in sales. One key inclusion was data on how promoting our Software as a Service (SaaS) solutions should be a major focus moving forward. DOMA is entering a period of reflection and growth, as we expand it’s important to have mentorship and guidance. Industry leaders like Google can help provide a roadmap to success. As one of the only major technology companies in the area DOMA is leading the vanguard into the unknown for Hampton Roads. Over 20 years DOMA has asserted itself as a local model for success and therefore might be paving the way for other tech companies to put down roots in the area.